Applications: Storage of small items of electrical, hardware, surgical, medical or similar. Plastic bins may be mounted on Louvre Panels or in shelving. Ideal for the storage of small loose items, hardware, components, etc. Available in a range of sizes for easy identification of contents. Bins may also be divided using dividers. Applications: Electrical, Automotive Spare Parts. 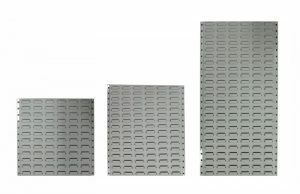 Plastic Spare Parts Trays are ideal for the storage of small parts in shelving applications. 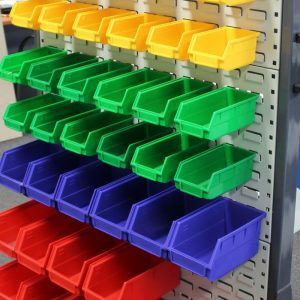 Manufactured from polypropylene to resist solvents and oils, they are available in widths to suit the shelves and can be divided to cater for very small parts using dividers. Additional dividers may be purchased separately. Sizes: 100/200mm wide x 300/400/600mm deep x 100mm high complete with 2 dividers. Louvre Panels can be mounted on walls or in other vertical locations to provide a simple means of organising Plastic Bins. Bins may be easily removed & replaced for transfer to the workplace. BOSCOTEKTMHigh Density Storage cabinets are designed to offer secure, efficient and robust work place storage units using configurable drawers and compartments to provide a storage solution for small parts, tools or equipment in a smaller footprint than can be achieved using conventional shelving systems. Cabinets are available in a range of widths and heights with drawer depths to suit a variety of part sizes. Drawer Partitions. Divide the width of the drawers into segments. Drawer Dividers. Used in conjunction with Drawer Partitions they are used to segment drawers into compartments from front to rear.